There are times I look back on the psychiatric training we Montreal General students got just after the middle of the last century and wonder if we somehow fell into the Middle Ages. We were right on the cusp of some major changes but we were still in a time when the hospitals were called asylums and some of our mentally ill patients still had the diagnosis "incurably insane" written on their charts. 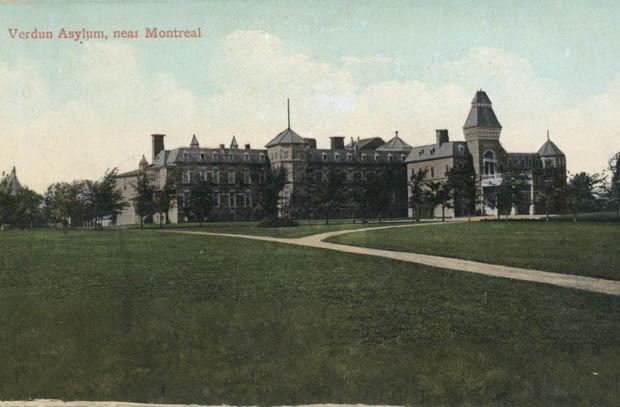 Our hard-core psychiatric work — I'm not sure I can honestly call it "training" — was done at what was then called the Verdun Protestant Hospital. It's now called the Douglas Mental Health University Institute. We referred to it only as "the Verdun" and my memories of it — of the actual hospital — are spotty. I remember the large grounds, with laid out walkways, because we were allowed to take certain patients outside for walks and I remember it being pleasant out there. If this is how the hospital looked, this would have been much earlier than my time. I can see it being like this however, before those trees matured. Dr. Heinz Lehmann, who became very well-known for his work in psychiatric drugs, was director of the Verdun and in some of my reading, I see that he described the hospital before some of the big changes that were to come, as a "snake pit." Oh yes. I worked on the women's ward. Most of the women had been there for years, some for decades. When we had some spare time, we could go into the record room and read some of the charts. There were thousands and thousands of pages written about each patient although we were astonished to discover that some of the charts had ended years before. It was as if there was nothing more to say. Some of the patients were harmless but we were warned that most had a very dangerous side. A couple of them, we were cautioned, were cleverly manipulative and they would behave almost normally around us, smiling, being helpful and conversational. The more experienced among us watched carefully because those patients regularly attacked young nurses after lulling them into feeling secure. It didn't happen to me but I saw it happen once; it was horrible and involved alarms going off, burly men appearing on the scene, our patient being held down (not easy, even for the burly men) and a vast amount of a tranquilizing injection administered under indescribable duress. It was scary and I realize, looking back, that there were a lot of things to be scared of there. We had to go through a tunnel to get from our residence to our work. That tunnel was awful and if we ever found ourselves alone down there, it was a nightmare. We did try to stick together. It was surely a stressful place to work but there were pleasant times too. Some of our patients were adorable, child-like almost (I guess we would be too if we'd been there for so many years, being treated like a child), wanting approval and loving hugs and hand-holding. There were two patients called Tilly. One was Tilly the White Rabbit who had been walking hurriedly up and down the same small piece of hallway all her waking hours for many years. She had worn a groove in the floor. Tilly the Police Officer walked purposefully around the ward, not looking as if she were noticing anything but in fact, aware of every little detail of what everyone was doing. If we needed to know something about one of the non-communicative patients, Tilly was our woman. But we always had to be careful. There was one patient, much much bigger than I, who liked to wrap young nurses in a bear hug. She got me in her grip one day and wouldn't let me go. I quite literally couldn't move and could barely breathe. I tried talking to her calmly, saying everything we'd been taught to say, but I finally had to yell for help. It caused quite a crisis on the ward. She was a difficult patient and she clearly enjoyed having the upper hand. I was never sure after if she remembered having done that. That was scary in itself. Our patients — as far as I know, looking back — were psychotic and they were being treated with massive doses of anti-psychotic drugs. I think this was a fairly new development and it was probably why the patients were able to function — in their own way. 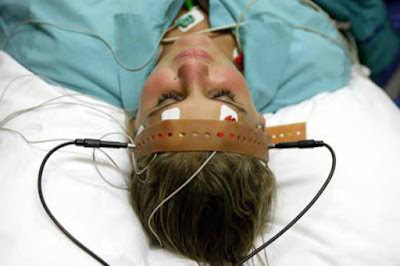 The thing that got me thinking about all this was reading lately something that referred in passing to electro-convulsive therapy — which we were ordered to say — also known as "electric shock treatment" which we were ordered never to say. I was still a few years away from being able to look at the incarceration and treatment of the women at the Verdun with a feminist analysis. For Her Own Good hadn't even been written yet. That will be a subject for another time. But I obviously have more to say about life in the asylum and being a nurse to the mentally ill so I'll be back with Part Two. Here are Parts Two and Three.